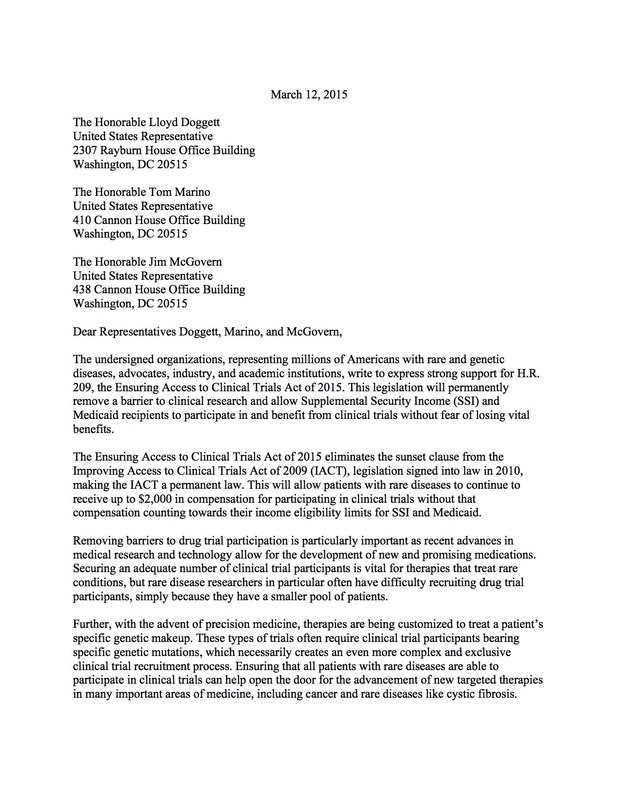 In March, First Focus signed two letters in support of the Ensuring Access to Clinical Trials Act of 2015 (S. 139 and H.R. 209). The first is addressed to Senators Ron Wyden (D-OR), Orrin G. Hatch (R-UT), Edward J. Markey (D-MA), and Sherrod Brown (D-OH), and the second to House Representatives Lloyd Doggett (D-TX-35), Tom Marino (R-PA-10), and Jim McGovern (D-PA-2), all leaders in the issue of access to clinical trials. The bill would allow individuals who rely on Medicaid or Supplemental Security Income (SSI) to participate in potentially life-saving clinical trials without endangering their eligibility for said programs.